How do slatted pool covers work? Like a bubble cover, a slatted pool cover floats on the surface of your pool but as they are rigid in one dimension, they can be pushed onto the water of the pool by a roller and removed in the same way. The slats are buoyant and flexibly joined to each other making them easy to use and easy to store on a roller. The roller may be manually operated or electrically driven and can be sunk into a pit or mounted above the ground at one end of the pool. Pool covers that are electrically driven can be powered by the mains or as a more eco-friendly option, they are powered by energy harvested from the sun by a solar panel. The photovoltaic (PV) cells are attached to the unit. Rollers mounted in a pit are usually installed when the pool is being built but above ground rollers can be retrofitted to most pools. The roller and slatted cover are usually then covered by a housing for weather protection and to give a neat finish. 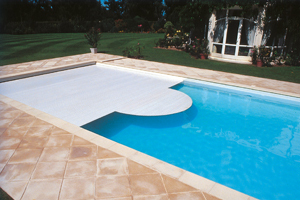 Slatted covers can be designed to accommodate Roman ends and many other pool shapes, not just rectangular pools. What different types of slatted cover are there? Slatted pool covers come in three main types; plastic slats, foam filled slats and polycarbonate slats. Plastic slats are the most reasonably priced. The slats are made buoyant by air pockets inside them and plastic end caps that seal each one. The slats are joined together by a ridge and groove – effectively a ‘clip together’ hinge. Foam filled slats don’t have end caps as the foam itself is buoyant and so doesn’t need to be sealed. The slats are joined together either by a rubber seal or by the groove system. Polycarbonate slats are often clear and let sunlight through to warm the pool. Solar slats will have a clear top and a black underside to increase the amount of warmth that can be drawn into the pool from the sun. Using a slatted cover will greatly reduce the heat loss through evaporation saving up to 75% of overall heat loss from the pool water and so significantly reduce the heating costs of the pool. Stopping evaporation also directly affects the quantity of chemicals used to maintain hygienic water conditions and reducing the amount of water needed to top up pool after evaporation. Slatted pools will also keep a pool clean and protect from dust and debris. They are not safety covers though and shouldn’t be counted on to keep children safe when the pool is not attended. RollEnergy. A powered, slatted cover that offers easy and quick installation into an existing pool or can be specified for a new build. RollFit. An automatic cover that preserves the elegance of a pool’s lines. The rolled up cover and tubular driver are discretely hidden behind immersed decking that is customisable to perfectly match the pool’s style. Dune. This automatic, above-ground pool cover system combines leading edge technology with DEL’s forward looking design philosophy. The slatted cover and tubular motor are supported by two powder-coated, aluminium modules that are as much inspired by modern art as they are by functional design. DEL also produce replacement slats that will fit almost any slatted pool cover allowing you to upgrade or modernise your existing pool cover. Just ask your local pool dealer for details of the DEL range. If you would like help in finding a pool professional in your area then just use the contact button at the top of this article.